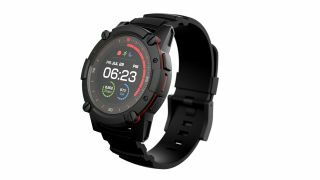 Matrix Industries has revealed the PowerWatch 2 at CES 2019, a successor to its original PowerWatch and PowerWatch X smartwatches that remain fully charged by using body heat. The new model has several improvements on its predecessor, which, despite its miraculous charging tech, didn’t have much worth bragging about. Matrix added always-on GPS, a heartbeat sensor and other bells and whistles to bring the PowerWatch 2 nearly to parity with leading smartwatches. Its black, rugged exterior looks much like the PowerWatch X, but has a sharper 1.2-inch screen – and it’s in color this time. There's also a solar panel ring around the inner rim of the watch’s faceplate, which is mostly there to reassure users who don’t quite believe the smartwatch’s thermoelectric generator can power the wearable by itself. It runs on a custom OS specially designed by Matrix to sip (not drain) power; likewise, the thermoelectric tech and processor are all proprietary. Of course, that custom tech could make it onerous for third parties to design apps for the PowerWatch 2. As it stands, the watch supports Google Fitness, Apple Healthkit and Strava out the gate, but time will tell if lack of access to watchOS or Wear OS keeps developers from creating for the wearable. In the meantime, the PowerWatch 2 has its own set of apps, mostly to track health (steps, sleep, even the power a user generates). If nothing else, it’s a robust fitness tracker. That all comes at a (literal) cost: the PowerWatch 2 retails for $499. Or will, assuming the IndieGogo campaign Matrix launched is funded through to production. If you want a cheaper PowerWatch 2, get one for a $200 early bird cost.